Nano-kirigami, or ‘paper-cutting’ on the nanoscale, enables a one-step, on-chip and real-time 3D fabrication of unprecedented nanogeometries through 2D-to-3D shape transformation. The ancient Japanese art of paper cutting and folding – or kirigami – transforms flat, two-dimensional cutouts into three-dimensional structures. Scientists believe a similar approach at the nanoscale could offer a simple fabrication route to complex three-dimensional architectures such as micro-/nanoelectromechanical systems (MEMs/NEMs), energy storage systems, and biomedical devices. Now researchers from the Institute of Physics – Chinese Academy of Sciences, Massachusetts Institute of Technology (MIT), South China University of Technology, and University of Chinese Academy of Sciences have, for the first time, used nano-kirigami to produce nanodevices that can manipulate light [Liu et al., Science Advances 4 (2018) eaat4436]. The team used a focused ion beam to cut two-dimensional patterns into suspended thin gold films just a few nanometers thick. “We cut the material with an ion beam instead of scissors by writing with the focused ion beam across the metal sheet in a prescribed pattern,” explains Nicholas X. Fang of MIT. The same ion beam is then used to irradiate the cutout pattern at a low dose, which either knocks out gold atoms from the lattice creating vacancies or lodges gallium ions from the beam in the thin film. The vacancies create tensile stresses, while the embedded gallium atoms produce compressive forces. The tensile and compressive stresses distort the thin film, causing it to bend, buckle, and twist, causing the three-dimensional structure to ‘pop-up’. The topographic design, therefore, determines whether a cutout pop-ups, bends downward, or twists out from the two-dimensional thin film. By using the focused ion beam to both cut and irradiate the thin film, the researchers have designed a one-step, in situ nano-kirigami process that can create intricate three-dimensional structures such as pinwheel-like architectures showing strong optical chirality – filtering out light with a particular polarization. The researchers also developed a set of equations that allows the determination of the precise pattern needed to generate a particular set of optical characteristics. The optical devices created using nano-kirigami are an order of magnitude smaller than their conventional counterparts, point out the researchers, and the approach could offer a route to more complex nanoscale geometries that could not be produced by conventional nanofabrication techniques. 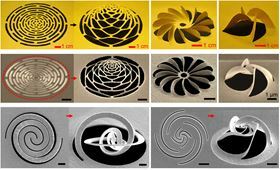 The researchers produced a range of exotic three-dimensional architectures resembling flowers, baskets, propellers, Fibonacci spirals, and even delicate spider web-like structures. “The nano-kirigami approach is quite straightforward and could lead to more complex optical chips for sensing, computation, communications systems, or micro-/nanophotonic, electronic and biomedical devices,” says Li. John A. Rogers of Northwestern University believes the researchers have found some truly creative ways to produce well-controlled three-dimensional metallic mesostructures by harnessing mechanical bending and buckling in suspended, two-dimensional thin film precursors. It will be challenging to scale-up nano-kirigami as a fabrication technique and reduce the cost, but the researchers believe the versatile approach is promising for complex optical chips for a range of applications. “We have, for example, already successfully employed a nanokirigami structure to build up ultrathin radial gratings with crosspolarization,” says Li. The researchers are now working on large-scale fabrication and reconfigurable metamaterials/metasurfaces under electrostatic and nanomechanical forces. This article was originally published in Nano Today 22 (2018) 1–2.